By 1874 Nat Gould was being blown off course from what his mother intended. She was alarmed by how thoroughly he was settling in at Pilsbury Grange. Her own childhood experience had taught her how harsh and unrewarding farming in Derbyshire could be. Mary Gould had no wish for her son to become a farmer. She decided he should transfer to Bradbourne, to the farm of her brother William Wright at Haven Grange, to become a proper farm worker. “Give him all the hard and nasty work you can,” she told her brother, “and he’ll soon get tired of it” (1). Vain hopes, for it turned out quite otherwise. Fond as he was of Pilsbury Grange, his father’s ancestral house, Nat was even happier at his mother’s beautiful home village. 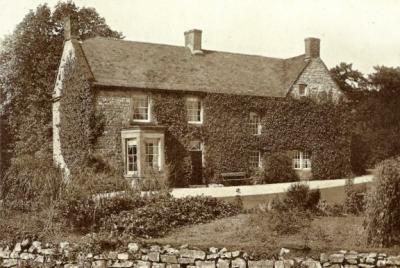 For ever afterwards he regarded Bradbourne as his true home. "The memory of it never left me; it came across the thousands of miles of ocean like a breath from the dear old hills. To learn to love the hills and valleys of England a man must go far away, live abroad, spend years of his life from the land of his birth --- then he realizes how intense, how deep, is his affection for everything he has left behind, and what a mighty longing there is to see it all again.” (2). There was plenty of hard work, but Nat was not discouraged. And he had before him the example of his uncle. William Wright was an industrious farmer, always active. He had a bright cheery smile, but meant what he said. If he ordered something done, it was no use shirking it, for his eagle eyes were everywhere. If Nat and his fellow worker Old John took a breather, Uncle Will would be sure to appear and chivvy them back to work. Summer or winter, day or night. In winter, life was just as hard at Haven Grange as it had been at Pilsbury. He recalled being woken by his uncle at three in the morning to attend to the lambs on Haven Hill, and searching for sheep buried in deep snow. Then there was all the hard work in cutting turnips and cabbage for winter fodder. And the long hours of labour in the summer, working till twilight. Yet Nat simply thrived on the life. Most of all he enjoyed working with the horses. He found ample opportunity to enjoy his pleasure in riding, never losing a chance of getting a mount. He made all sorts of excuses to get on a horse. He galloped his favourite grey Bob along the broad grass verges of the Ashbourne to Buxton road at Newhaven, and rode him to Hanson Grange and Hartington, Matlock, Wirksworth and Ashbourne. “Once, when I was mounting him at Mayfield, where my grandfather was living with my mother, he was almost the death of the old man. He had come on to the road to see me mount, and no sooner was I on the grey’s back than he lashed out, and just missed him by a hair’s breadth. I had never known him do this before, and it gave me a shock. He took it quite coolly, and merely said: ‘Mind you don’t break your neck, and his too, on your way home’” (3). When horses needed shoeing they were taken to the smithy in the neighbouring village of Brassington. Young Nat would make a day of it, then having to explain that there were several horses waiting their turn when he arrived at the blacksmith’s. “It’s a curious thing,” said his uncle, “but every time you take the horses to the smithy the place is full. I can’t account for it. (4)” There must have been a twinkle in Uncle Will Wright’s eye. Nat was usually a hard worker. But after two happy years, his farming days at his beloved Bradbourne ended all too soon. He and his mother had to face the fact that there was no prospect of his ever buying or leasing a farm of his own. He would have to make his living elsewhere. His mother urged him to have another try at the tea trade. Nat was reluctant, but eventually gave way, and sorrowfully he returned to Manchester. It was 1876 (5). (1) The Magic of Sport page 36. (2) The Magic of Sport page 33. (3) The Magic of Sport page 51. This incident must have taken place between 1874 (when Mary Gould left Manchester) and 1877 (when she went to Newark). Grandfather Wright then went to live in a boarding house in Duffield where he died in 1882. (4) The Magic of Sport page 55. (5) For a detailed account of his farming in Bradbourne see Nat Gould: The Biography by Tom Askey (2017) pages 9-13.